I'm Smoking a Chuck Roast. How Do I Smoke It? 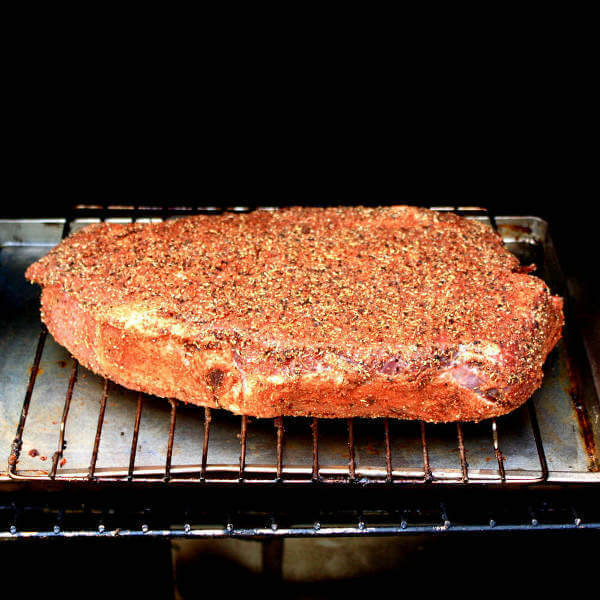 What are the dos and don'ts of smoking a chuck roast? Help please. I have a Masterbuilt smoker, and have smoked ribs, turkeys, and pork loins, but have never smoked a chuck roast. Chuck roast is a great piece of meat for the smoker. It's typically tougher and fattier than most people want for grilling, but when it's cooked for extended periods it becomes tender and juicy. When smoking a chuck roast, be sure to start with a good one. Find a roast that is well marbled with fat for the best flavor. I prefer the bone-in roasts. They seem to have better flavor. Trim the excess fat from around the edges and Chuck is ready to be seasoned. 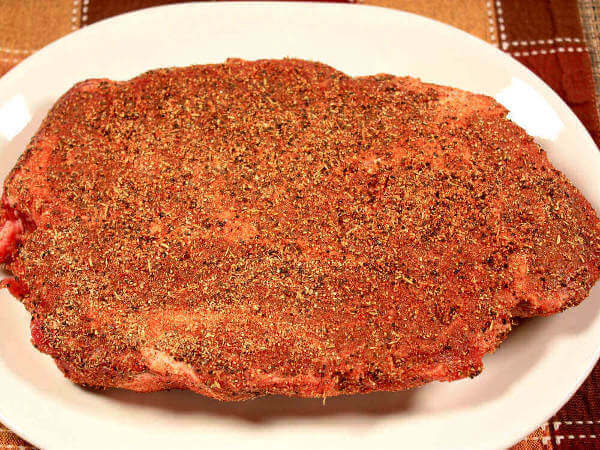 Like briskets, chuck can be marinated and/or seasoned with dry rub. These are even good when simply flavored with salt and pepper. I often coat the meat with yellow or Dijon mustard before applying dry rub...it helps it stick tightly. Any good rub you use for brisket is appropriate for seasoning a chuck roast. Helpful Tips That'll Take Your Smoked Chuck Roast To It's Final Glory! Smoke at 225-250 degrees for about 4 hours. Appropriate woods to use for smoke are any of the fruitwoods, like apple or cherry. Oak and pecan work well to. For a more robust smoky flavor you can try a bit of mesquite wood chips, but not too many or the flavor will be overpowering. When the meat temperature reaches 150 degrees, wrap the meat in aluminum foil, using two layers of heavy duty foil to prevent leaks. The juice will be used to further moisten the meat before it's served. 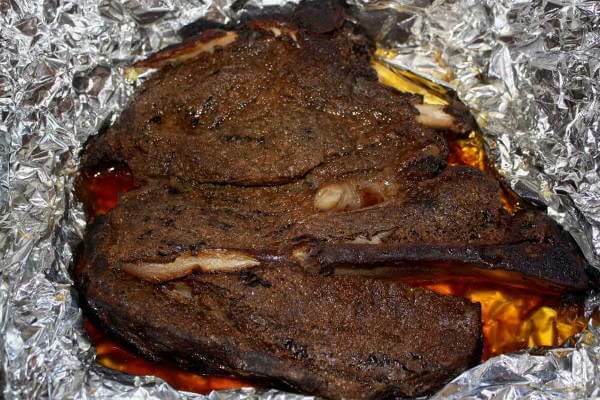 After the beef is wrapped in foil it can can be finished either in the smoker or inside in the oven, set at 250 degrees. Continue cooking the roast another four hours, or until the internal temperature reaches about 200˚F. At that temperature the meat will be fork-tender. Getting That Tender Beef Ready For Makin' Sandwiches! Carefully pour the collected juices into a container and place it in your fridge. Let chuck rest for about a half hour. Remove any remaining pockets of fat, then shred it with a couple of forks, or just chop it up with a big, sharp knife. 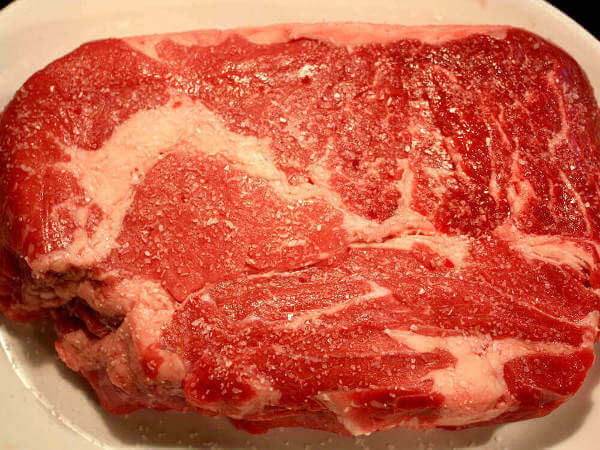 Remove the fat from the top of the cooled beef juice, then add the de-fatted juice back into the shredded beef. You can add a bit of your favorite bbq sauce to the shredded chuck if you want, or serve it on the side. This makes killer sandwiches!